How do I purchase an item from this site? How do I cancel my order or bid? How will I know if I've won an item? How do I Pay for my winning item? I don't have a PayPal account, can I pay with my credit card? I've won an auction, how long do I have to pay for my item? Q: How do I cancel my order or bid? A: Please contact the seller and request to cancel the order or bid. Q: How do I contact the seller? A: You must be registered and signed in, in order to contact a seller. After finding the listing, click the options (or gear) icon to the right of the order and select "Contact"
You can choose to "post a question" for all to see (scroll to the bottom of the listing). You can send a message directly to the seller about the particular item. 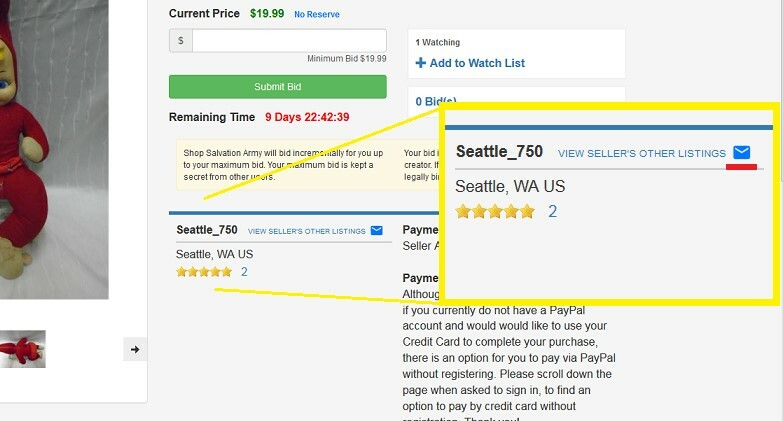 Locate the small blue envelope icon next to the seller name. Once you click the blue envelope icon, you'll be directed to the messaging box with the item in question. Q: How will I know if I've won an item? A: You will receive email notifications for all winning items, and it will also be listed in the Won tab of your accounts page. Q: How do I Pay for my winning Item? A: To Pay for your item(s) you've won, go to your My Account page and on the left tab (or Click Here). A: You may also access the Invoice tab to see all of your open orders, awaiting payment. A: We currently accept payments through PayPal only. Q: I don't have a PayPal account, can I pay with my credit card? A: PayPal does provide an option for non registered users to complete the payment online without logging in. Proceed to checkout by clicking the "Pay with Debit or Credit Card" button. Q: I've won an auction, how long do I have to pay for my item? A: Please complete your payment within 5 days of the auction's end. If you require additional time to complete your payment, please contact the seller for an extension as soon as possible. We will send out reminder messages to your account before the order is cancelled, and if a response or payment is not received before our final message, the order will be cancelled.